How NOT To Get Put Into LinkedIn ‘Jail’! Here’s an invitation to connect I’ve received this very morning, which I’ve shared to help you avoid be put into Linkedin ‘jail’. The intent is to get me to buy & make contact. But I won’t because I don’t Know, Like, Trust them. These invitations will probably cause this person’s account to be restricted with an IDK. 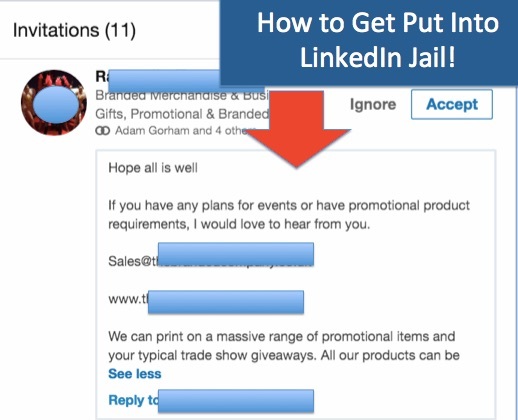 When a lot of recipients select this in relation to your invitations, LinkedIn will place you in ‘jail’ to protect its members. It will restrict your account so for future invitations you’ll need to know the person’s email address and will monitor your account. So… DON’T send a sales message as your invitation to connect! DO send a personalised invitation with the reason why that person might wish to connect. WHEN they connect, resist the urge to sell, relationship-build & deliver value to your connections with status updates, articles and messages. This doesn’t mean you shouldn’t invite those to connect who you don’t yet know, just do it differently. We’re getting connection rates for our clients to their ideal prospects of 25-60% each month, even though they don’t know them. To assess if a service like this is right for you, visit Prospect Booster and watch this 3-minute video.